Preheat the oven to 450 degrees and prepare a baking sheet with foil or use a non-stick baking sheet. Rinse the kale and remove the ribs. Coarsely chop the leaves. Rinse and chiffonade the basil (stack the leaves, roll into a cylinder, and cut into ribbons). Allow the butter to come to room temperature or microwave for 15 seconds to soften. Cut each chicken breast into thirds. In a bowl, combine the softened butter and grated Parmesan. Add a pinch of salt and pepper to taste. Coat the chicken pieces evenly with the mixture. Place coated chicken on the prepared baking sheet and bake for 15-17 minutes, or until chicken reaches a minimum internal temperature of 165 degrees and is lightly browned. Remove from oven and keep warm until ready to top with sauce. While chicken is baking, prepare the kale. In a medium pan, warm 1 tsp. olive oil over medium heat and add garlic, 1 Tbsp. water, and kale. Don’t be afraid to crowd the pan with kale, as it cooks down considerably. Cook for 3-4 minutes. Remove from heat, add a pinch of salt and pepper, transfer to a plate, and set aside until ready to serve. 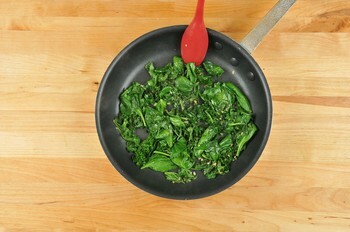 Place the same pan used to cook kale over low heat. 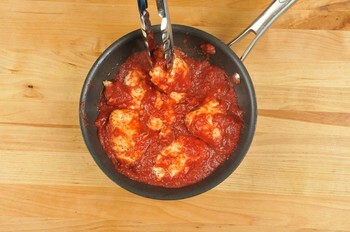 Add marinara sauce, ¼ cup water, and cooked chicken to the pan. Increase heat to medium, spoon sauce and sprinkle Mozzarella cheese over chicken. Cover with a lid to allow Mozzarella to melt, about 2 minutes. Add a serving of the garlicky kale to a plate. Place three pieces of chicken next to the greens. 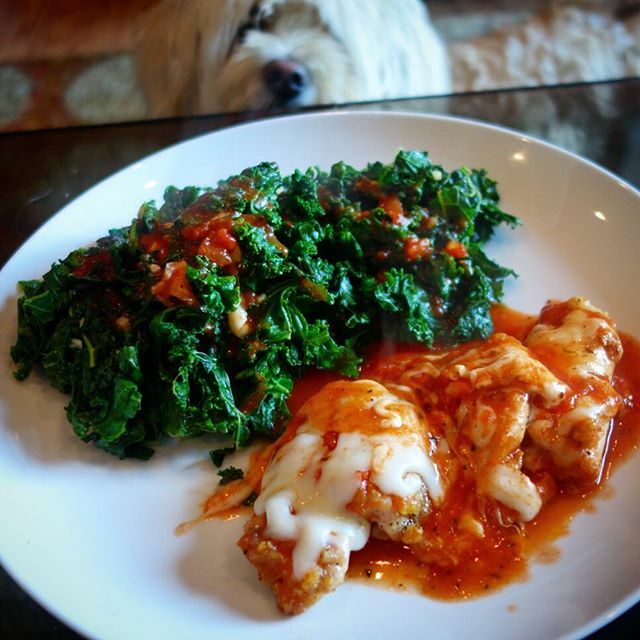 Spoon marinara over the chicken and kale and garnish with sliced basil. Great balance. I have to try this one !